Today’s Nice Price or Crack Pipe R5 will be woefully slow and will handle like a Weebles Wobble—but those are only two of its charms! Let’s see if this tidy super-mini is worth its asking in Gallic bread. I think “Sketchy” would be a good name for a clown, don’t you? Sketchy the Clown. What car would Sketchy drive? Well, yesterday’s 2013 Subaru BRZ might be a good choice seeing as all the sketchy elements surrounding its presentation. Those included the car being on a second engine owing to “hydrolock” from the rain, somewhat cheapo wheels, and the promise that the dinged-up bumpers would be fixed before purchase. All that and a turbo kit of unknown install quality led to 82-percent of you thinking that Sketchy would be better off walking on this sketchy Subaru. Imagine for a moment that your daily driver required 17-seconds to reach sixty, could do little more than that, lacked A/C, and had an engine that sounded like you should be threshing wheat rather than driving to work. Sound pretty miserable, huh? Now imagine you have that very same car as a weekend plaything, an exemplar of a bygone era that you use to toddle around in on weekends, visiting coffee bars and houses of ill repute… oops, I mean IHOP. Then it wouldn’t seem all that bad would it? Its quirks and limitations would then be endearing qualities rather than damning flaws. 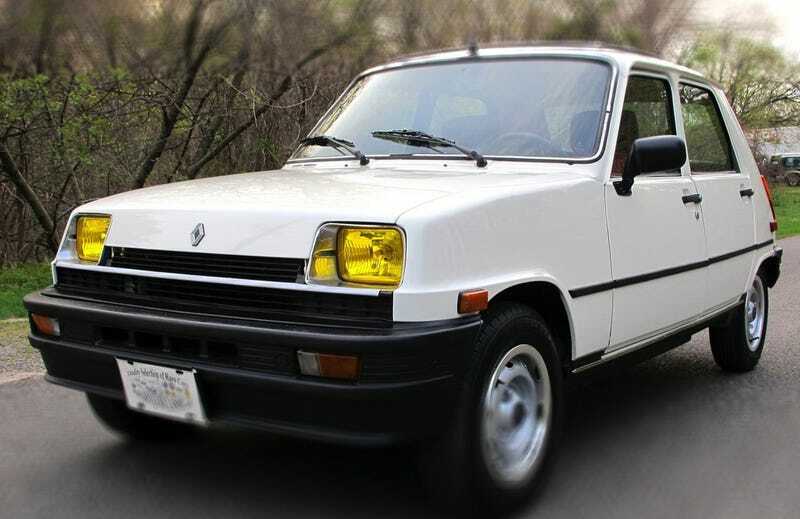 With that in mind, have a gander at this 1983 Renault R5, known to American Francophiles as the Le Car. Now, this isn’t a mid-engine R5 Turbo, but it is a mid-engine R5. That’s because the first R5 models featured a drivetrain lifted from the preceding R4 where the engine sits fully behind the gearbox and transaxle. Have a look inside at that natty interior. See how the radio faces upward like a flatworm’s eyeballs? That’s necessitated by the lack of room immediately in front. The 1,397-cc OHV four intrudes somewhat rudely into the passenger compartment between the footwells in these cars. It doesn’t offer much in return, providing only 50-horsepower, but with only about 1,800 pounds to cart around it’s not likely to be taxed too much. A four-speed stick provides shifting opportunities. This is a five door body and it carries the wonderful fabric opening roof for a sixth body piercing. The sauce blanche paint looks to have been refreshed at some point, and both it and the body underneath look to be in excellent shape. The red and black interior is likewise renewed and the ad claims leather as the covering of choice. There’s red carpet which is a nice accoutrement. In fact, why don’t more cars have red carpet these days? The dash looks to be in great shape too, right down to an apparently never lit cigar lighter. Pleasingly, the horn on the turn signal stalk is twee throwback to a simpler time. One thing you’ll notice inside an R5 is that, like Doctor Who’s Tardis, it seems unbelievably larger inside than its exterior dimensions allow. I don’t know how Renault did it—probably by sticking the spare up under the hood—but it’s a pretty roomy car for its size. This one’s being sold by an East Coast dealer, and while they claim the mileage to be 72K the CarFax shows a history of odometer shenanigans dating back to the mid-‘90s. Having a look at the car, head to tail, indicates that whatever mileage it rocks, it’s been treated to a refreshing spa day and now looks pretty good for its age. According to the ad there’s no road rot on the car and it comes with yellow headlights because that’s how the French roll. Would this make a great daily driver? Probably not. It’s going to be slow, and it’s not going to be all that safe. It would make a wonderful weekend car however, and we now need to decide just how much week day work pay should be allocated for its purchase. The dealer is asking $4,700, plus $149 to fill out the paperwork they have to fill out and file. What do you think, does that seem like a deal to get your R5 on? Or, does that price make this a Le Car for which you have to say le no? eBay out of New Jersey, or go here if the ad disappears. For $20,000, Will This 2013 Subaru BRZ Turbo Blow You Away?